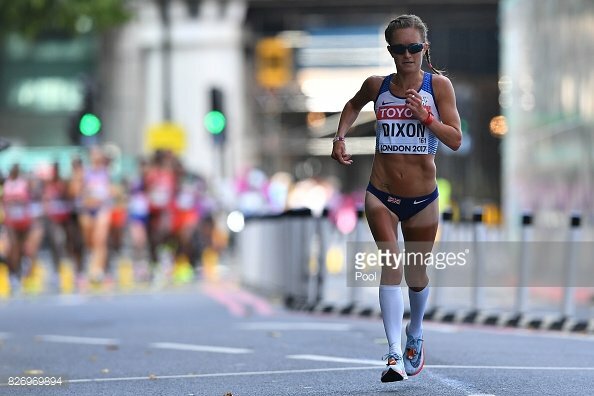 Aly Dixon | Marathon running: it's not a hobby, it's a lifestyle. As an endurance athlete it is important for me to know how my body is responding to training, not just from a fitness perspective, but from a physiological and chemical/hormonal perspective. I’m lucky to have linked up with medichecks to be able to track my blood values to make sure that everything is how it should be. I take the elite endurance test which tests for over 50 different blood values from a full blood count through to hormone through to proteins. The tests are very simple to conduct. You order your kit online, it comes within a few days with all you need included. You then go to a local clinic and get your blood taken. For my test it was 3 small vials which needed to be taken fasted and at least 12 hours after any physical activity. I didn’t need an appointment at the clinic I just popped in. Once the bloods were taken I sent them away in the prepaid package and within a few days I had an email with all my results and a full explanation of what they all meant. This is my 3rd round of tests so I now have a pretty good baseline to compare. From previous results I have found that my ferritin levels can be slightly on the high side and that my thyroid was also slightly high but everything else was where it was expected to be. This time around everything but my urea and vit b12 levels were good. My urea was showing as slightly high which was probably due to dehydration, I must admit, my hydration hasn’t been as good as it normally is so only myself to blame. My vit b was within the normal range but very close to the bottom so the doctor advised me to take a supplement and hopefully we should see an improvement in my next tests in 12 weeks time. These tests aren’t just for elite athletes, anyone can take them. I find them essential, especially when in hard training or about to start a hard training block as all of my efforts can be in vane if my body is low or high in certain areas. If anyone wants to do a test themselves, have a look at www.medichecks.com there are loads of different tests available so you are bound to find the one you need but anyone doing an endurance sport I can really recommend the elite endurance pack. Don’t worry if you know nothing about what the results will mean, you get a full interpretation from a qualified doctor who understands sport and recommends any interventions which may be needed. I always say we can’t all be Olympians but we can all know our bodies like Olympians!! A couple weeks ago I had to make the toughest, most heart breaking decision of my athletics career and withdraw from the upcoming European Championships. Running for your country is every athletes dream. It is the highest honour and privilege to wear the GB vest at a continental or global championship. When you reach that level you want to make sure that you are in a position to put in your very best performance and I know right now that I couldn’t do that. Yes, I could go and COMPLETE the distance but I couldn’t COMPETE to the very best of my ability. I couldn’t do myself, the team and my country justice. The good news is that I am not injured! (Or at least I wasn’t when I made the decision, ironically a couple of days later I picked up a calf/achilles strain!) I am healthy and fit, just not marathon fit. To run any marathon well you need to have undergone a certain level of preparation. Solid long runs, long tempos, good speed endurance and I haven’t been able to do this. After the Commonwealth Games I underwent a small operation on my heel to fix an inflamed bursa which had been troubling me since this time last year. I wasn’t allowed to run for 7 days after and then had to gradually build back over the next 4 weeks. As soon as I could I was in the pool, on the bike and eventually the cross trainer as I slowly built my weekly miles back up – 20, 40, 60, 80. As much as the cross training helped me retain my aerobic fitness I knew I was in a fight against time to get marathon fit in only 8 weeks. My endurance was strong but my speed was bare. Thankfully every session was an improvement on the last, but still not where I wanted or needed it to be and that wasn’t going to change significantly in 4 weeks. The decision to withdraw was made even tougher as feasibly this could be my last chance of representing GB. I’m 40 in September and this would have been my 14th marathon. I’m being realistic when I say I probably only have another couple left in me, so I want to make sure that they aren’t wasted and that when I next stand on a marathon start line that I am in good enough shape to challenge for a PB and hit the type of time I know I am capable of. Good luck to the rest of the team heading out to Berlin, especially the marathon girls who are in with a great chance of winning a team medal. I’ll be cheering you all on!! A week on and last Sunday still feels quite surreal. I went into the race knowing I was in great shape, probably the best shape I’ve ever been in. The Saturday before I’d done my usual final 5k track tempo and it was 43 seconds faster then pre VLM. So I knew I was in very good shape. A 2pm start time was totally different to what I’m usually used to for a marathon but food etc was adjusted accordingly. I’d decided it would be best to split my breakfast so that I didn’t over eat but also didn’t leave myself hungry waiting until 10.30 to eat breakfast. I saw Alex the physio to get my stiff ankle mobilised at 8am then headed down for some banana on toast and a coffee at 8.30 before having my Porridge and another coffee at 10.30. The race start and finish were on Tower Bridge which is about 1km from our hotel so we strolled across at about 12pm. Warm up for a marathon is really short, 1 mile jog, change shoes, a stride then I’m ready. However with it being a championship race we had a call room to go through where we get our timing transponders so timings had to be changed accordingly to fit that in. Call room closes 25 mins before the race starts and if you are not inside by then you miss the race. Call room was the usual chaos but once out on the Bridge we had time for a stride then we were ushered onto the start line. There was a bit if a rush for prime positions on the start line but I was happy to stand 2 or 3 rows back. There was 26.2 miles ahead of us, it wasn’t going to make that big a difference. When the gun went the pack moved off at quite a sedate pace. I found myself up near the front and just relaxed and waited for the pack to settle to see where I ended. Like I say, the pace was quite sedate so I found myself sitting comfortably up front. The 1st mile was only 5.44 so perfectly within my comfort zone. My race was neither brave nor gusty. All I did was follow my pre-set race plan. That plan was to try and run splits around the 5.35-45 zone through to 30km and then hopefully pick up a little for a strong finish and try to get a low 2.28 clocking. Training suggested I was in around 2.27 shape so given the course 2.28 was a good target. 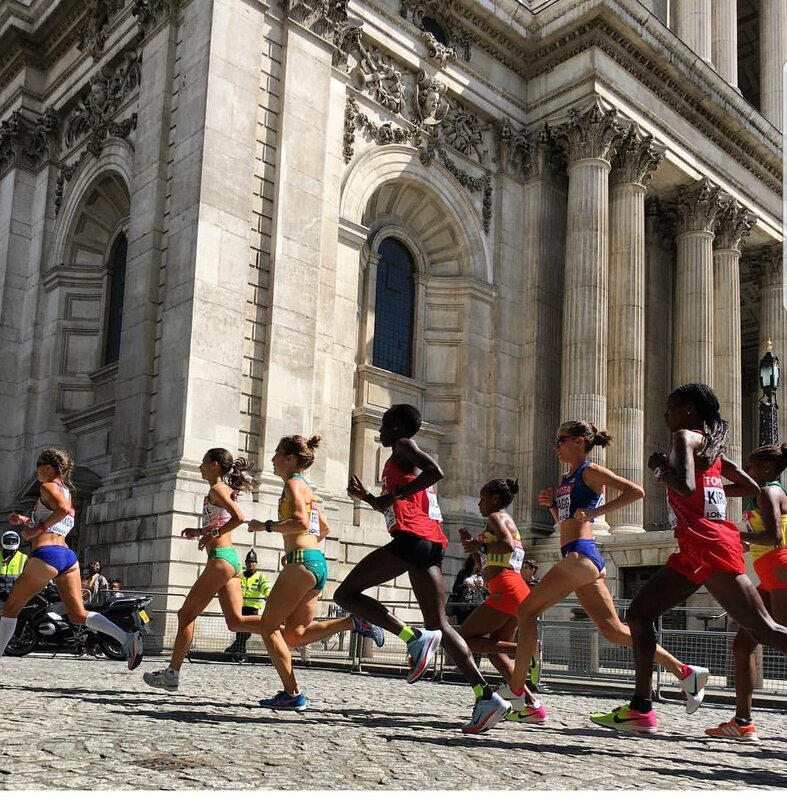 One Portuguese girl went off the front and opened up a sizeable lead early on but the main lead pack seemed quite happy to run around this pace and let her go so I settled in and enjoyed it. The crowds were fantastic giving lots of vocal support and I managed to spot a few familiar voices along the way and acknowledged them when I did. As usual feed stations were a bit chaotic but I managed to get my bottle without mishap. As we weaved through the City section of the course I took a mental note of the twists and turns and the 3 or 4 little climbs that there were. Watching the race coverage back on iPlayer someone fell on one of the corners. This was one of my big fears about running in the middle of a big pack and one of the reasons why I had gone to the front – it’s a little safer there! Approaching 9k we caught the Portuguese girl and I thought to myself if I can just hold it here until the 10k split I will always have an official race split saying I was leading the World Championships Marathon. Little did I know that I would go on to have 3 of these by the end of the race!! I knew I was leading, obviously, but I thought that the rest of the pack were right on my shoulder and were going to come past and swallow me up any second. I hadn’t really increased the pace dramatically, a little surge at the feed station as usual to get a clear run at my bottle but other than that still hitting my planned splits. I was constantly checking my watch to make sure I was on pace and doing nothing silly but the rest of the field just didn’t come with me. By the time I got down to the bottom turn around point someone shouted I had about 30 second gap. I just laughed at that and thought they were crazy then coming round the cones I looked over and realised they weren’t!! Still I wasn’t running anything fast. Just sub 2.29 pace, well within my capabilities and actually slower than I’d done in London Marathon back in April. I was loving the crowd support and egging them on to get even louder. It helped me take my mind off splits etc whilst also pushing me along. All the time I was waiting for the pack to come and swallow me up. 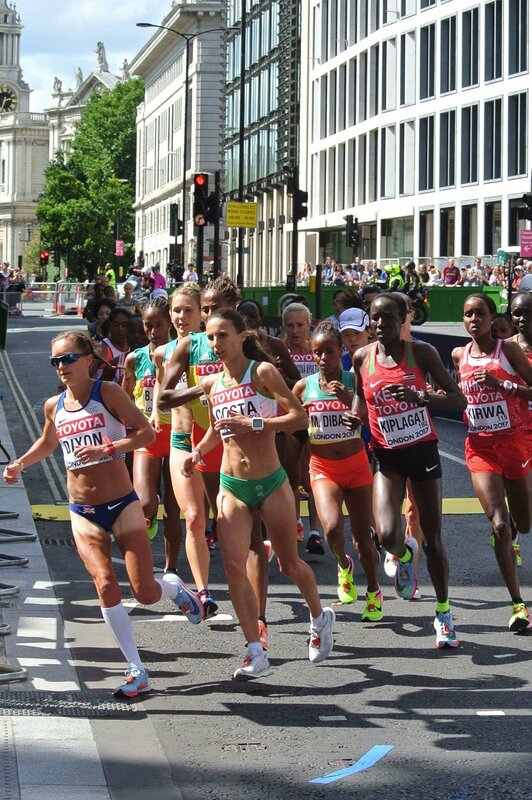 I never for a minute thought I was going to run away from these girls, they are world class marathoners, I’m not. All I was doing was running my race plan and enjoying myself doing so. Yes, I could have sat back with them running outside 2.30 pace but I’m the type of athlete who find it’s hard to do a huge increase in pace over the last 5-10k and I knew that if I wanted to run a PB that the best way to do it, for me, was to try and run equal halfs. In terms of trying to finish as high up as possible, I also knew that I wouldn’t be able to live with the increase of pace of most of that pack come the last 5-10k. They were capable of lifting it to 2.24 pace or faster, I wasn’t. My biggest mistake of the race was when they caught me at around 30k. Instead of just sitting in the pack and going along for the ride for a few miles, I stupidly kept fighting and went back to the front of the pack. Mile 20 ended up a 5.15 Mile!! And mile 21 wasn’t much slower at 5.23. I knew I couldn’t keep that up so eased back and hoped that I hadn’t done myself any damage but it was too late. I settled back into my pace but mile 25 the wheels came off and I dropped to 7.02! For the first time in the race my head went down and I was in survival mode. There were times during that mile when I thought my legs weren’t going to make it to the end. The crowds were still incredible and they knew that I’d given the race my best shot. Coming back past the Tower of London they managed to lift me, my head came up again and I was using every last bit of energy I had left to get myself to the finish line. Coming on to Tower Bridge someone stuck their hand out for a high 5 and I responded. Next thing I know there’s hundreds of hands sticking out! I managed to spot my sister and best mate in the crowd and they handed me a flag. I was nowhere near a medal or even the top 10 but I took the flag and proudly waved it across the line. I was nowhere near a medal or even the top 10 but the crowd made me feel like a champion. I’m only 5 foot tall but I felt 7 foot for those last few hundred metres. My body was wrecked. I stumbled across the line and went down like a sack of potatoes. The amazing Amy Cragg was still celebrating her fantastic bronze medal (inspiration right there!) Came over to check that I was ok and poured some water over my head before I was carted off in a wheelchair to medical. A medicinal can of coke and a mars bar and I was fine to make the long walk back across the Bridge to the media zone. The smile never left my face. My ‘A’ goal had been to finish in the top 15. I’d just missed that but considering I was ranked 23rd going into the race I still over performed to finish 18. I had wanted to run a lot faster than the 2.31 I ended up with. I know I am in far better shape than that but those fast 2 miles at mile 20 & 21 put pay to that, not the first 19 miles. But would I change anything? Honestly, no. I stuck to my race plan and had a blast doing so. 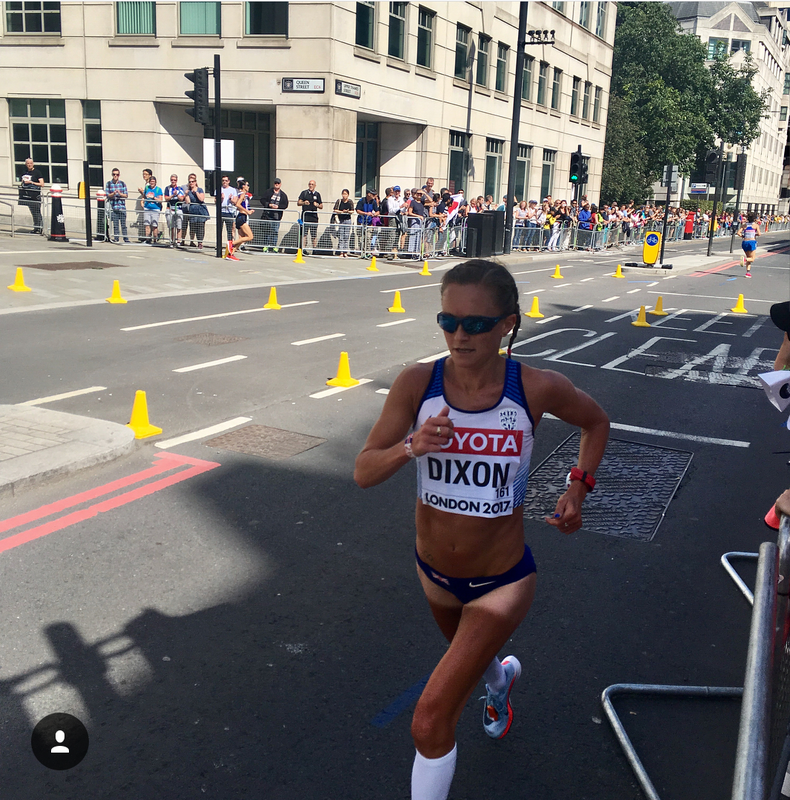 Never in my wildest dreams did I ever think I would be anywhere near leading the World Championships Marathon, Never mind being out there in front for over an hour. I know some people have criticised the BBC commentary team for being ‘negative’ towards me saying it was only a matter of time before I got caught and that I wouldn’t win a medal but what they were saying was completely true. Paula and Steve know me well enough to know that I was under no illusion that I could run away from these girls and that I was just running my own race plan. Paula has seen me train the last few weeks, she’s jumped on a bike and played waterboy on my long runs and Gary, her husband, has paced my track sessions. She knows what shape I’m in and knows how I like to run races. She was almost reading my mind when she said I would be counting down the miles waiting for them to catch me. I firmly believe that life is about seizing the moment, taking your chances when they come as you’ll never know if you’ll get the same opportunity again. Im 39 next month, this was most likely my last World Championships so I wanted to give it my very best shot. I did just that. I finished knowing that I had left everything out there on the road. Not sitting back thinking what if. April 23rd Virgin Money London Marathon. I went into the race in great shape, ready to run fast. I didn’t really have a race plan set out other than to run with the 2.28 pacemaker and see how I felt as we got into the race. The outcome is pretty much well known. 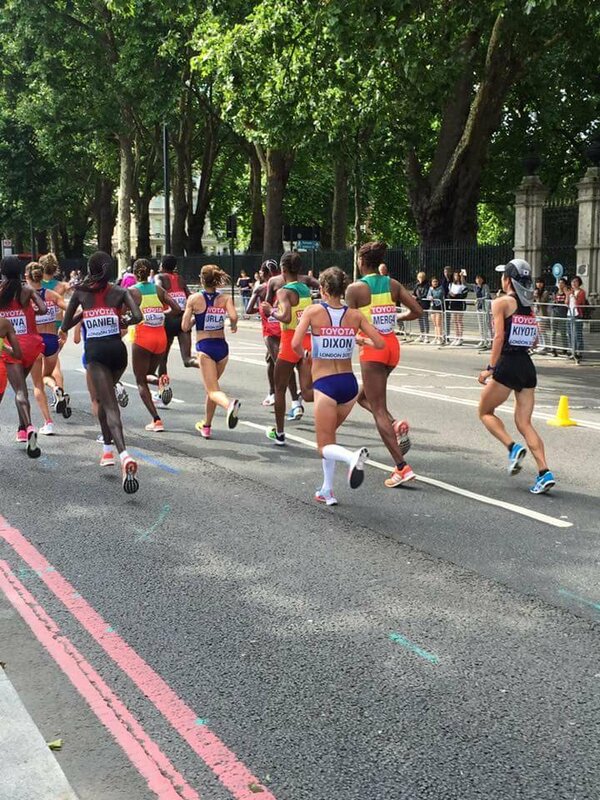 I felt good and found myself with a slight gap over the other British girls at 10k so pushed on by myself. I was surprised one or two didn’t come with me as there had been whispers of a few going for sub 2.28. I felt great throughout the race. It’s so much harder to run solo, churning out 5.35-40 splits mile after mile with only the help from the very loud crowd to push you on. The girls behind me running in a group with the pacemaker definitely had the easier ride, they just had to tuck in and be dragged along but I like to do things the hard way! By the time I got to mile 23 I could sense that someone was closing in on me. I wasn’t sure how far behind they were or who it was but I had a feeling that it was Charlotte and that turned out to be correct. Unbeknown to me at one point she closed me down to 7 seconds but I kept telling myself I hadn’t ran nearly 20miles by myself to be caught now and kept on pushing. Finally Buckingham Palace came into view and I knew then that I had the 1st Brit spot secured without needing a sprint finish like last year. When I watched back the BBC coverage Paula had commented on there that I was knackered as I came round the corner onto the Mall, it shows how well she knows me because she was so right!!!! I finally saw the clock and mustered a kind of sprint finish, in my mind I was sprinting like Bolt, on the large screen I looked like a hippo wading through mud!!! I stopped the clock in a nice new PB of 2.29.06. Of course those 7 seconds are still annoying me now but at least I came away from the race knowing I could go faster and where I dropped the time, things to work on during this training cycle. As 1st Brit and running under 2.36 I was guaranteed selection for the World Champs to be held back in London on August 6th and here I am now just 14 days away from that. I had my usual 14 days of no running after London and then managed to fit in a nice little jog around the Sunderland Half Marathon. This was a really special day as Paula had agreed to come over and run too. Getting to run your hometown half marathon with the greatest female marathoner (and good friend) is definitely special and created some very precious memories. Of course, just because she’s the GOAT, doesn’t mean I was going to let her win. Even with the marathon still in my legs I managed to out sprint her in a tight but friendly battle to the line. I got back into training and suffered a slight hiccup when I picked up a random 24 hour bug. Although the symptoms were short lived I gave myself a few extra days rest just to make sure. I couldn’t afford for it to return. 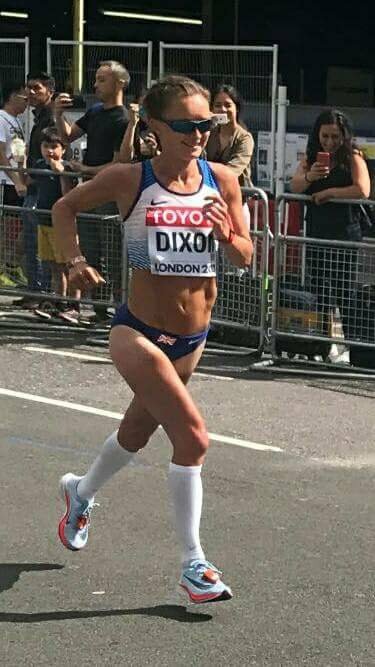 It meant that I was slightly under prepared going into my beloved Blaydon Race and this year I really couldn’t afford to be as I knew that my fellow Rio Olympic marathoner Sonia was also racing. I gave it my best shot but on the day my legs just didn’t have it past the 3 mile mark. I had to settle for 2nd place. I was pretty gutted as I would have loved to have earned the hat-trick but it wasn’t to be. It did however, give me the kick up the backside I needed to get back into good hard training. I’ve got one last biggish track session left on Wednesday and then that’s me officially on taper. This is the part I hate about marathon training. I LOVE running so having to cut back when you are feeling so fit feels alien to me. I have my tried and tested taper routine of cutting back the volume by 1/3rd in the 1st week and then cutting that volume again by another 1/3rd in the final week. I maintain frequency and intensity during this period so the body doesn’t close down completely and I start feeling lethargic. I don’t fly into London until the Wednesday before my race. 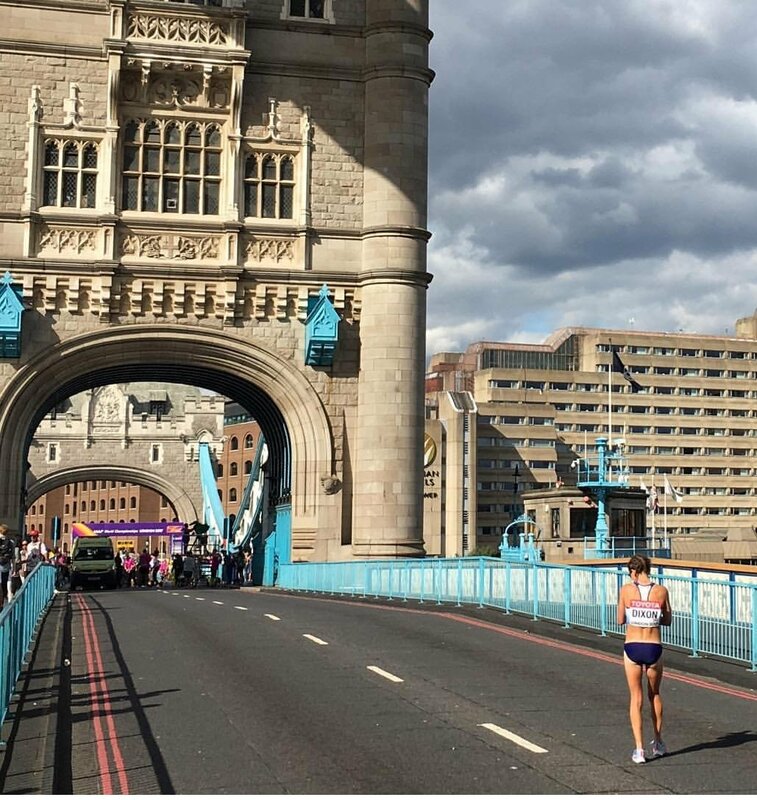 I’ve used this routine for the last 2 London Marathons and despite some freak outs in the first year it’s worked out great both times and I’ve felt amazing on race day. You have to be careful when coming down from altitude to race as you get windows where you feel absolutely horrific due to the body going through re-adaption to see level. I’ve found I can race well on pretty much day 2, 5, 10 and 21 down. But the period between 10 days and 20 days down is horrific especially when I’ve had an extended period (4-6 weeks) up here. So, another summer, another championships. I’m really looking forward to getting out there on the Streets of London and doing myself, my family and my country proud. If you are around Central London at 2pm on 6th August come down to the Tower Bridge/Embankment/St Paul’s area and give us a shout. It’s a 4 lap course so you’ll see lots of action and I can promise you it will be awesome!! I can’t believe it’s only 2 weeks until this year’s London Marathon, where did that year go?! I bet that there are many of you wishing that you could push the date back and have another couple of weeks to get the miles in?! There will also be a few who wishes it was here this weekend. Whichever camp you are in be sensible these next few weeks, this is where most people make the mistakes. They either worry that they haven’t done enough so try to cram more in or are in great shape but instead of just consolidating this shape they try to push on more to get in better shape. Both ways can end in disaster and a not too good race day. So my advice is to just stick to what you have planned. It’s far better to get to the startline slightly undercooked than slightly overcooked or even worse, don’t even make it to the startline. Whatever you do in training now wont give you any extra fitness benefit for the marathon but it can push you over that dangerous redline of injury and or overdoing it so sit back relax and trust in the training that you have banked. These last few weeks are for practicing what you will actually do on race day. So for your last long run, get up at the same time you will on race day. Have the same breakfast at the same time. Wear the same kit – including socks, and undies!! And make sure you practice your race nutrition. If you’ve not tried lucozade sport yet, grab some and try it, race day is not the time to discover that it doesn’t agree with your stomach!! For me, I’m once again training in my 2nd favourite place in the world – Font Romeu. I’ve been up here for a few weeks now and loving it as much as ever. Like the rest of you the hard work is already in the bank, just another week or two of some sharpening and freshening up and I’ll be ready to go. So far training has gone really well. Since the beginning of the year I’ve averaged 111 miles a week. I spent January in Kenya again. I loved every second of it this year thanks to a great group of guys to train and hang out with. It great to see people actually training together in groups this year instead of everyone doing their own thing like last year. It made the trip so much more beneficial and enjoyable. I changed my training slightly a few times and jumped in with the middle distance girls for some sessions and once again discovered that I am never going to make a 800 or 1500m runner!! But it was fun and beneficial to get some fast 1k, and 400m, 300m, 200m reps done300m, even if I was left flat on my back after! I’ve been left a bit frustrated with the races I’ve done so far. I know I’m in great shape but it’s just not showing itself in races. Mind, the weather isn’t helping and my glute med going into cramp at Reading wasn’t ideal. But at the end of the day I know what shape I’m in from training and fast races in the build up to a marathon don’t really mean much it’s what happens on the streets of London come the 23rd April that counts and I’d swap all the fast times in the world for a good one that day! Thankfully it hasn’t all been hard training lately. I’ve managed to do some fun things with family too. I miss out a lot on school holiday fun with my nephew and cousin so during the February half term I York them down to Jump 360 in Stockton and had some fun bouncing around on the trampolines. It’s a brilliant place for both kids and adults – I think my sister had more fun than the kids. There’s lads of different parts to the park, not just trampolines. There’s a giant airbag, dodge ball, balance beam, foam pit, stunt beds and much much more. Unfortunately I couldn’t bounce around too much as I was worried about getting injured but the others loved it and we had to drag the two young ones off! I’ll definitely be taking them back after London so that I can join in with the fun more.